A city-centre hotel, Park Plaza Sherlock Holmes London is located near the Underground station on Baker Street, made famous by Sherlock Holmes. Take in the London Zoo or stroll through the lush gardens of Regent's Park, both located nearby. 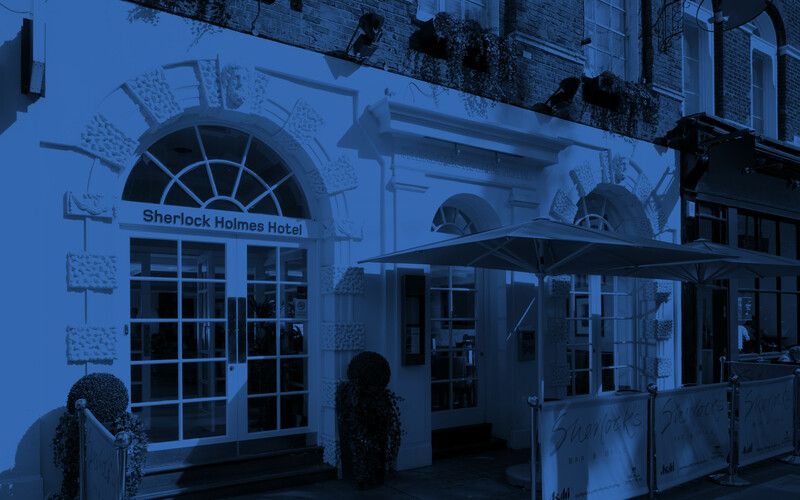 Our hotel in Marylebone also puts you within walking distance of The Sherlock Holmes Museum, Madame Tussauds, Oxford Street and Bond Street. If you are on an extended leisure break, add a few more attractions to your itinerary such as Buckingham Palace and Hyde Park, both within a 15 minutes’ drive of the hotel. Only 45 minutes away by train, this world-class shopping centre boasts 160 international fashion brands, three upscale restaurants and several quaint cafes. Three of London's most iconic attractions are a quick trip from our hotel. Buckingham Palace is the official London residence of the United Kingdom’s reigning sovereign. Guided tours are available. Board the giant Ferris wheel for an unparalleled bird’s-eye view of London. The London Eye is Europe’s tallest fixed Ferris wheel. Explore King Henry VIII's former hunting grounds, now home to Kensington Palace and Gardens, The Serpentine lake and more. The capital’s criminal history comes to life at this terrifying, 90-minute experience, one of London’s signature attractions. Internationally famous, Madame Tussauds is where the world goes to see waxen figures of the stars. Marylebone Village isn’t your ordinary shopping centre. Nestled in a chic residential area, this retail paradise balances international brands and independent brands for a one-of-a-kind experience. Selfridges is a high-end department store with locations all around the U.K. Find the dress of your dreams, designer men’s accessories or the perfect outfit for your little one. Located where else but at the famous 221B Baker Street, this museum honours world-renowned fictional detective Sherlock Holmes. You can climb the 500-plus steps to the top of architect Christopher Wren's historic cathedral to catch a stunning city view or visit the famous Whispering Gallery. Europe's second-largest stadium hosts the FA Cup Final and England’s national football team. Browse for deals, enjoy family-friendly dining options or pick up something elegant in a high-end retail store at London’s largest shopping complex. The world’s oldest scientific zoo has been open to the public since 1847. Visit the animals, see daily demonstrations, and watch the feedings.